Kim of Kims Wig Botik, sat down with Host & Business advocate Gary Atencio on "The best of Denver on Consumer News TV", and discussed what it takes to be "The Best of" in this industry. Welcome to Kim's Wig Botik! For over 35 years we have been the home of the finest human hair wigs, human hair hairpieces, and clip-in extensions, as well as synthetic wigs and synthetic hairpieces for women, men, and children in Denver, Colorado and beyond. Our goal is to bring out the beauty of every individual that walks into our store no what the circumstances are. We specialize in working with patients undergoing cancer related therapy (i.e. chemotherapy and radiation) and patients suffering hair loss from alopecia. That's not to say that we only carry chemotherapy wigs and alopecia wigs, we also have a large variety of fun and fashion wigs. We recognize there are many reasons for hair loss in women, men, and children and we understand the frustration that comes from wanting to retain a healthy, youthful appearance. At Kim's Wig Botik we are proud to offer a wide selection of 100% European human hair wigs, hair pieces and clip in extensions made from the finest European human hair available in the market today. 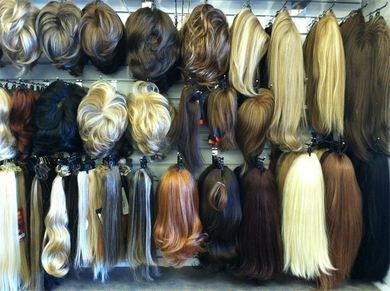 We also offer a large selection of synthetic wigs and hair pieces. What ever style you are looking for or your budget, we have a solution that will be right for you. We don't stop at just wigs and hairpieces either, we offer all of the products that you will need to clean, care for and style your wig. If you're one of the many that enjoy being "beautifully bald", we also offer an assortment of headwear; hats, turbans, and scarves to match your individual personality and style. Whether you are suffering from mild or severe medical hair loss, or are hoping for a make over inspired by the hottest red carpet celebrities, you will find everything you need right here in our southeast metro Denver Wig Salon, Kim's Wig Botik! Check out our wigs and hair replacement services for Women, Men and Children, or come in and visit our store today. See for yourself why we have the largest satisfied and repeat customer base in Denver, Colorado and beyond. No need for an appointment, we are available to serve you anytime during our normal business hours. A human hair wig will allow you to style your wig with heat including curling irons, flat irons, and blow dryers. You have the freedom to choose where the part is located and to change your wig's hairstyle on a day to day basis. You can even use your own shampoo and styling products. While you have more freedom as a wig wearer, human hair wigs are generally more expensive because they are 100% human hair and often have advanced cap constructions that include hand-tied mono-filament tops and lace fronts. The beauty of a synthetic wig is the ease of use. A high quality synthetic wig truly acts as a "ready-to-wear" product at all times. Just give it a good shake, throw it on, and you are ready to face the day without much styling. While synthetic wigs are more affordable and easier to maintain than human hair, you must be careful to avoid extreme heat. Exposure to hot elements like the heat from an oven, or heated styling products are sure to damage the fibers. Synthetic wigs also have the option of hand-tied mono-filament tops and lace fronts to make the wig look as natural as possible. Hairpieces can be a valuable asset to any accessory collection. We have human hairpieces and crown topettes also known as "toppers" that can be styled and incorporated into your own hair with your own styling products to cover up thinning or gray spots, or even to give you temporary highlights so you don't have to damage your hair with coloring products. Our synthetic hairpieces are a little easier to manage and will help give you the volume and length you've been looking for. Hairpieces are also very helpful as an added piece when creating the perfect up-do for a special occasion. They can help add fullness or volume in just the right areas, helping to make your style look more polished. 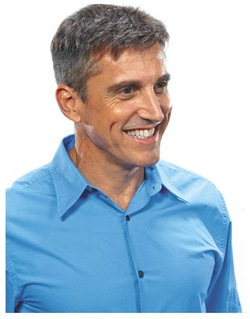 There are many options for men seeking a non-surgical hair replacement solutions at Kim’s Wig Botik. We offer a variety of synthetic or human hair replacement systems to fit most any budget. Whether you are looking for immediate full replacement of hair, semi permanent, gradual replacement, partial or full coverage, we have a hair replacement system that will work for you. We are pleased to offer many synthetic as well as human hair replacement systems with styles and colors being virtually limitless. Our staff will be happy to assist you in selecting the right mens hair replacement system to fit your look and lifestyle. At Kim’s Wig Botik we recognize that our youngest clients are often the most active. For children, especially teenagers, losing their hair can be both traumatic and devastating. We understand the importance of maintaining a socially active lifestyle as well as feeling good about how they look during the time of regrowth. We strive to help our youngest clients feel great during what can be a very challenging time. 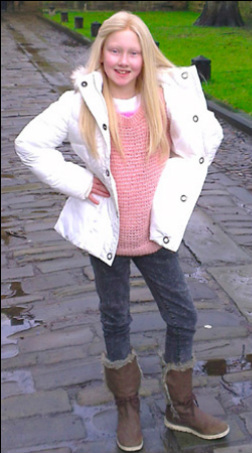 We stock many sizes, styles, and colors of children’s wigs at Kim’s Wig Botik. Our expansive children’s wig inventory allows for same day selection, fitting, styling, and wearing out of the store! Specializing in the Foella® Gripper™ Wig System, wigs with natural densities in sizes specially designed for children, it is possible to have a new wig in less than a day. Most importantly, Foella® Gripper™ wigs don't require taping or gluing, which makes wearing added hair while being a regular kid easier than ever. If you choose not to wear your wig all the time or you are a confident soul who has made the choice to be beautifully bald, we offer a variety of headwear to suit your needs. Bare scalps can often be sensitive to the touch and to sunlight. It is important to have headwear to protect your scalp, provide comfort around the house, and to provide warmth at night while you sleep. 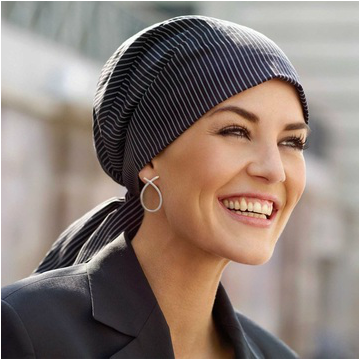 We have a variety of stylish hats, wellness turbans, and scarves for those clients undergoing chemotherapy treatments. We are continuously ordering in the latest color trends and keep the basic colors in stock, so we will be sure to have something that will coordinate with your wardrobe. 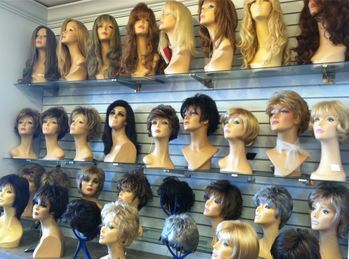 At Kim's Wig Botik we pride ourselves on not only having the largest selection of wigs to choose from, but our ability to make any wig you pick more "you." Wigs are often manufactured with a little too much hair which can make any wig look unnatural. We can thin out your wig, give it a trim, cut layers, or even add hair to increase length, volume, or highlights. We also use deep conditioning techniques to wash your wig, reset the style, and make it look and feel like new again. There is no reason to settle for a wig that doesn't make you feel confident, we can style it and help you feel fashionable and proud of your hair. We offer several wig services including a basic wash, condition, dry, and style. If your wig has worn out over time or has been heat damaged, we have proven techniques that can bring back the life and vigor of your wig. If your wig has uneven hair we can sew in new sections of hair to replace the ones that have been lost over time. Maybe you just want the added security of clips to prevent your wig from sliding, we can add those for you as well. Consultations are free and we will do everything you can to make sure you are happy with your results. Don't be shy! Wigs are not only for people experiencing hair loss, wigs and hairpieces can be fun and fashionable. 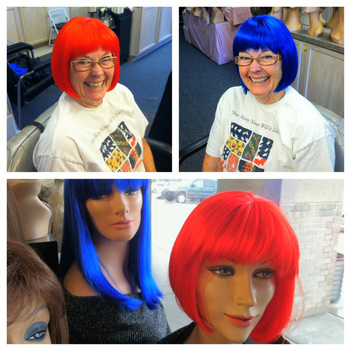 Whether its for a night out on the town with the ladies, spicing up your date night, or even to support your favorite local sports team, Kim's Wig Botik has the right wig for you! We carry a wide variety of fun fashion wigs for every budget and taste. Come on in and have some fun with our experienced stylists that will make you ready for any event you are planning! Why Shop at Kim's Wig Botik? I stopped in today to find a 3/4 wig for vacation. Kim helped me, and was very knowledgable. She found the perfect piece for me, and the price was very reasonable. I will return! After battling 2 months of massive hair loss, my wife decided to look at wigs to boost confidence. We arrived from Oklahoma (6 hours) in the morning as they opened. All three of the women in the shop catered to my wife needs. Above and beyond what we expected. They took her step by step through the process and styling. Kim styled the one for my wife to wear that day and worked with us to get her all the accessories need to keep it in great shape. We will definitely return. Thank you ladies for the help can't express the gratitude. Took my friend here to get her first wig and was blown away by the prices, knowledge and the compassionate understanding of Kim and the employees here. They knew exactly what she wanted and helped her get styled and everything! Definitely recommend!! I came here with a friend when I was visiting from California. My friend has been wearing wigs for over 10 years due to a medical condition. She wanted me to post a review since she doesn't have a yelp account. 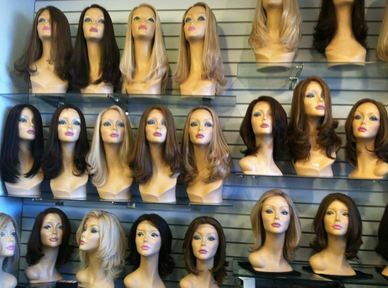 The service was excellent and they have a wide selection of beautiful wigs. The wig shop is full service in that they will sit you down, put it on for you, and help you style it. The owner and the manager are so sweet and my friend came away so happy with her experience there. I guess she found her new wig store. We were so pleased to work with Kim and her team. Her attention to detail and selection of wigs and toppers for the face shape were perfect! They are caring, fantastic, knowledgeable and most of all helpful. I cannot recommend them enough. We had no wig experience and she made the experience pleasant and comfortable for the whole family. After looking online for solutions to my thinning, disappearing hair, I discovered something called a "topper." I found Kim's online, as well, and today, I went in to see if they could help me. The minute I walked in the door, I was welcomed, seated, and being matched with exactly what I was looking for. I could not have had a better experience, and I would highly, HIGHLY recommend Kim's Wig Botik to anyone looking for a solution to hair loss. Today I went to Kim's wig shop to see about getting a wig now that chemo is making my hair fall out again. Anyway Kim and her staff were extremely pleasant and very helpful while staying in tune to the emotional side of the customers like myself going through cancer. I would recommend Kim's Wigs to all of those looking for a wig for any reason or occasion!! I had the best experience when I visited these wonderful ladies. First, they are the sweetest women I have met in a long time. Kay's knowledge of product was impeccable. I was looking for a speedy purchase and she was able to match my color right away. She gave me a great price and even helped me put the hair in. I had a show I was rushing to where extensions were requested. I highly recommend this place. I drive all the way down from Westminster and it was totally worth the traffic and 40 min drive. Thank you ladies! You're amazing! Fantastic place. Highly recommend . These ladies know "their stuff" , great selection, very supportive. Tried another place in Cherry Creek before, no comparison. After having been the recipient of a very bad haircut, I was actually ashamed to be seen in public. So, what better way to hide my shame than to purchase a wig. I had been wanting to purchase for some time and now was the opportune time. The shop has an incredible selection and the staff was very helpful. I left the shop with exactly what I was looking for: color, length, style, etc. I'm hooked and ready to purchase another. Thank you to Nancy and Kim. Always Great customer service. You can tell Kim truly knows the ins and outs of this business. She treated my husband and I with such compassion and grace. Thank you for your advice on styling and top of the line wigs. This has been the best "Medicine" that we had. She hit it out of the park both times. We will continue to be her customers. My godmother is going to be losing all of her hair due to chemotherapy and every other wig shop we had gone to was no where near as incredible as Kim's. We were both treated with respect and compassion. All of our questions were answered and we never felt as though we were being sold to. Everyone on staff especially Kim were very nice. We will absolutely return should my godmother need any more wigs. Stop by our store today, regain your self confidence, and feel your best with a luxurious European Human Hair Wig or Hairpiece from our extensive collection. We have been helping women feel beautiful for over 35 years! We love helping our customers look and feel their best!